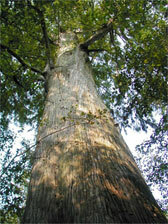 In One Champion Tree, we told you about the champion baldcypress (Taxodium distichum) of Mississippi found at Sky Lake Wildlife Management Area in northern Humphreys County. In this article, we will focus on Sky Lake itself. 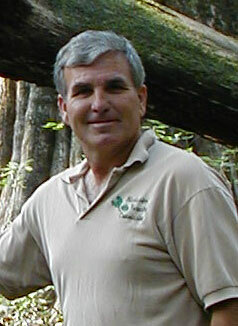 I accompanied Walter Passmore of the Mississippi Forestry Commission and a small group of foresters on a field trip to Sky Lake to see the big tree. We left early on an October morning from the Jackson Hilton (where almost 200 foresters from around the country had attended the 2004 National Association of State Foresters Annual Meeting) and headed north towards the Mississippi Delta on U.S. Highway 49. Our goal was a crescent-shaped expanse of Delta woodland, dusty and dry after many weeks with no rain. Seen from the air, Sky Lake traces a gentle arc across the Delta, punctuated on all sides by the shiny rectangles that denote the many catfish ponds of the area. Seen from the road as we approached, it seemed to be nothing more than another line of trees growing along one of the many watercourses that stretch across the land. But this particular line of trees hides many secrets. Sky Lake is an oxbow lake with no recent connection to any river seen by modern humans. Around 5700 B.C. or 7,700 years ago, during the Early Archaic period, it was part of a distributary of the Mississippi River, much the same as the Atchafalaya River in southern Louisiana is a distributary of the Mississippi today. According to the Mississippi Wildlife Foundation, the oldest known evidence of human occupation in the area around Sky Lake dates to 4,000 years ago. 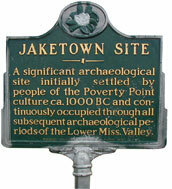 Just south of Sky Lake is the Jaketown Site, with mounds dating back to 1100 A.D. This site is listed on the National Register of Historic Places. In a photo composite (above right), the size of the previous state champion baldcypress can only be hinted at. One needs to actually walk up to the giant tree and touch it to fully appreciate its size and age. 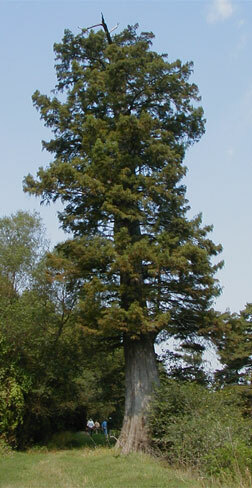 A "smaller" baldcypress towers over the path leading to the shore of Sky Lake (left). Note the small group of people near its base. Although they are several paces beyond the tree, this will give you an idea as to the size of this baldcypress. 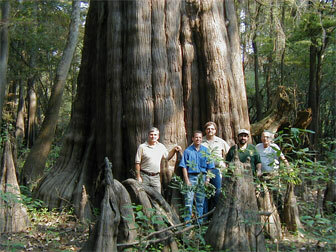 We stopped at the sight of the cypress that had previously held the title of the largest at Sky Lake. But moving on further, we soon came in view of the baldcypress that had until recently been THE state champion—only 70 feet tall but with a circumference of 47 feet. The large fluted base is hollow with a narrow entrance on one side. We all took turns squeezing through this crevice to look at the heart of the great tree. Interestingly enough, the temperature was noticeably lower inside by about 10 degrees. Standing inside this giant, I could almost feel the full significance of the Sky Lake Wildlife Management Area. We also visited the lake itself, walking along a raised roadbed to the edge (below) where Rubén Padrón of the Purto Rico Forest Service noted the tracks of whitetail deer and raccoon in the soft mud at the water’s edge. Sky Lake’s 773 acres provides habitat for a variety of shorebirds, waterfowl, and aquatic and amphibious species such as alligators, turtles, frogs, and crayfish. Our approach had disturbed a flock of egrets feeding near the shore. They took flight at our approach and landed near the center of the lake to wade and continue their feeding, giving us an idea as to the shallow depth of Sky Lake (note white specks in the photo below). The local people have known of the beauty and significance of Sky Lake for years. Soon the rest of us will have the opportunity to walk among the cypress, perhaps one day along raised walkways, and stand on the shore of this ancient lake. These links will open a new page.